Lentil as Anything is proud to be working with David Laity from Goodwill Wine. David explains "Like so many on Black Saturday, I lost most of what I owned. I was grateful to be alive and had no idea of the overwhelming support that would be provided. Because of this kindness I was able to start again. Using the $15,000 given to me through the Red Cross Bushfire Appeal, money that had been donated by people like you, I began Goodwill Wine as a way to pay forward this incredible generosity. My idea was simple. I would go directly to the vineyards and find some of the best value, boutique wines Australia has to offer. I would build a reputation based on a steadfast commitment to quality, and I would pass on 50% of our profit margin to the charity or non-profit organisation of your choice. 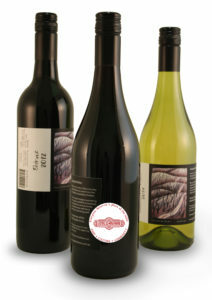 Goodwill Wine aims to use these quality wines as a canvass to further awareness of the organisations you support. In acknowledging that there are over 700,000 charities and non-profit organisations in Australia, we also provide a Goodwill Label enabling you to support a charity or cause even if Goodwill Wine does not have a direct partnership with them." 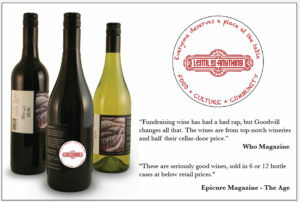 David has kindly put Lentil on its list of charities, meaning 50% of Goodwill Wine's profit goes to Lentil as Anything. See how much has been raised so far here. It sounds like a win-win for everyone.. and a wine-wine! Come on and visit us at Lentil as Anything Thornbury and try the delicious, organic, vegan wine range.